In the final days before my wedding, I watched so many television shows about weddings and wedding planning. My husband and I already had a solid idea of what we liked, disliked, and planned on doing in our own wedding. I enjoyed watching these shows to see what different ideas and tastes other brides had. I hope my ideas and pictures will help inspire you in your own wedding planning. 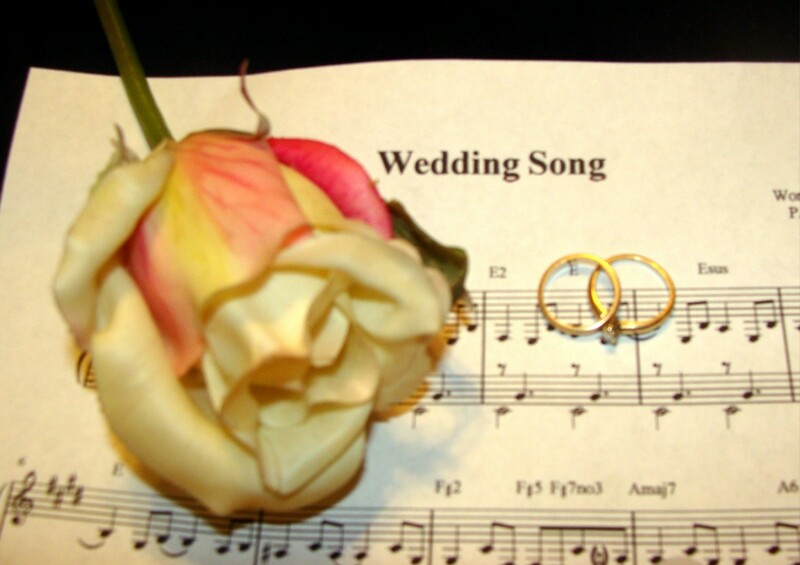 Traditionally, a wedding has "colors" and many weddings today are planned around a "theme." There exists a fine line between too little and too much. 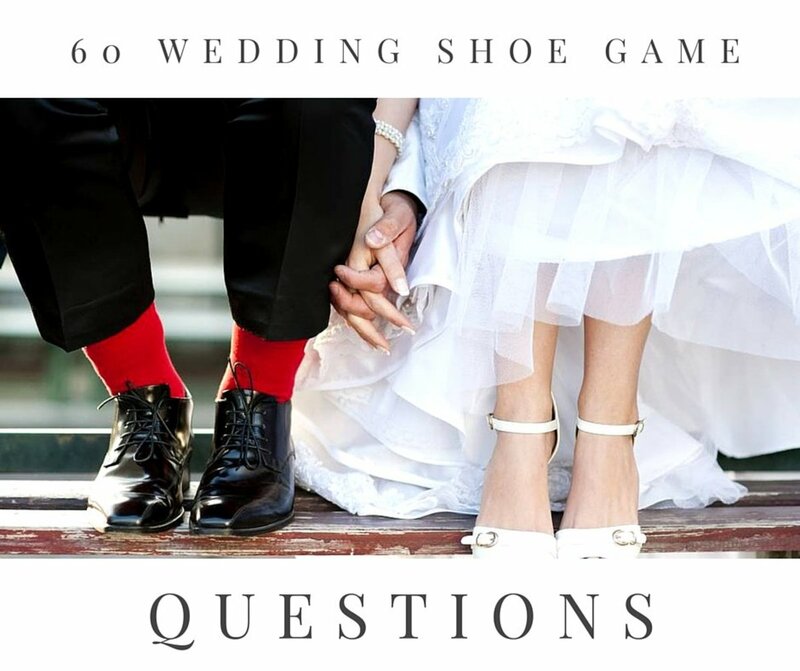 With not enough representation of the wedding colors or elements of the wedding theme, whichever touches are present almost seem there by accident and your guests may have trouble connecting the dots. 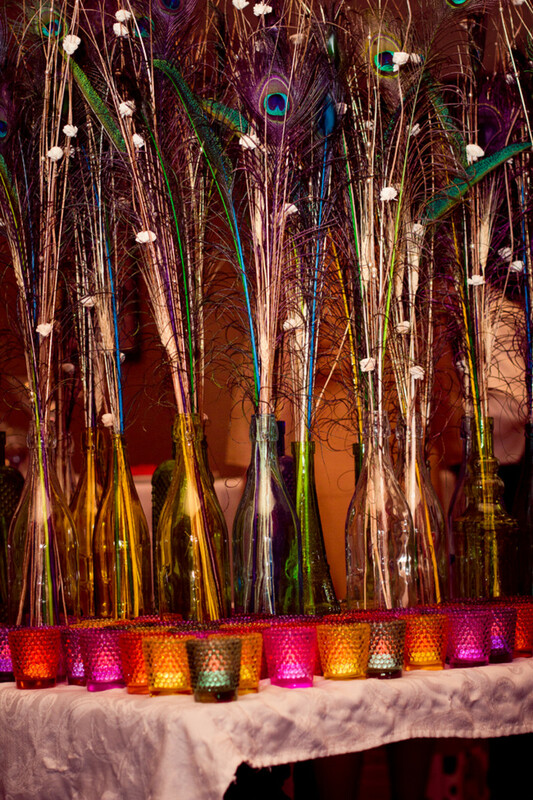 On the other hand, if your wedding colors and or theme are too dominant, it can become overdone and tacky. Picking a theme and colors can be tricky. It can be even trickier to tie everything together in a way that is natural and not forced. Does my wedding theme clash with peacock feathers? If the answer is yes, then maybe you shouldn't use them or look for a feather that is a more suitable alternative. example: a beach theme wedding-- If you can't connect your wedding theme and peacock feathers using less than 10 words, then don't. This is a sign that they probably won't connect aesthetically, either. Do my wedding colors clash with peacock feathers? If the answer is yes, then you shouldn't use them. example: your wedding colors are red and yellow-- If you're die-hard about using them, then look for peacock feathers that are dyed in your wedding colors. Warning: they might look tacky, so sleep on any ideas before they become purchases. Last advice, look for other feathers. I bet you'll find something you love and it's every bit as luxurious as peacock but 100%-less clash-tastic. We picked our wedding colors with a teaspoonful of compromise-- his favorite color (blue) and my favorite color (green). We ended up using a few shades of blue and green. While some couples have difficulty selecting a centralized theme, other couples have a hard time picking just one. My husband and I are statistics but everything blended nicely. 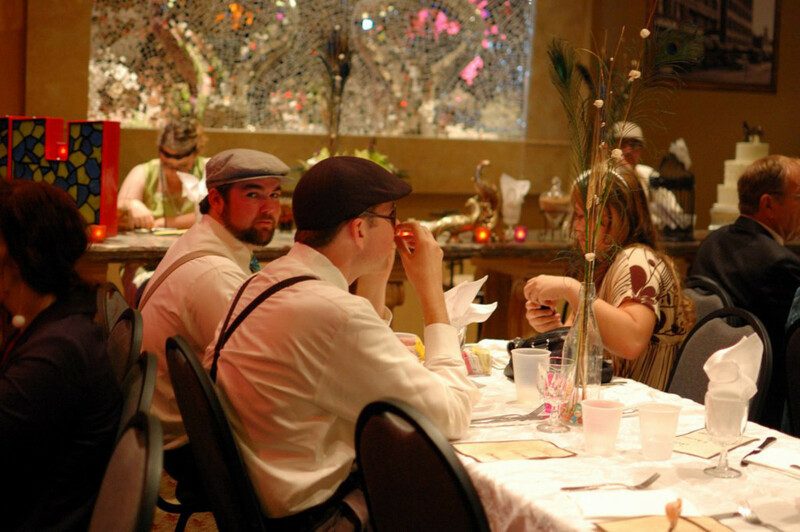 My husband and I had a few themes and motifs going on at our wedding but our main theme was 1920s. 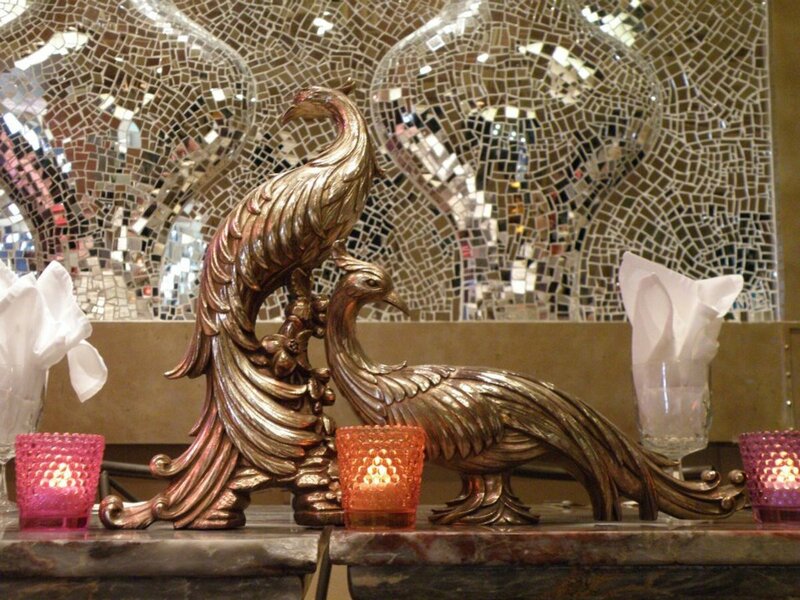 I'll share with you how we used peacocks and peacock feathers as a motif. I'll write more about the elements of our other themes in another hub, so stay tuned. 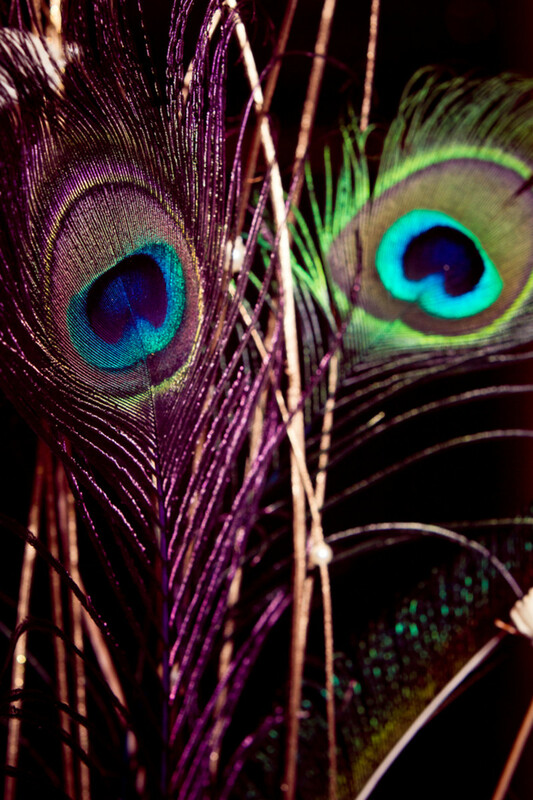 But for now, we'll just focus on peacocks and peacock feathers. 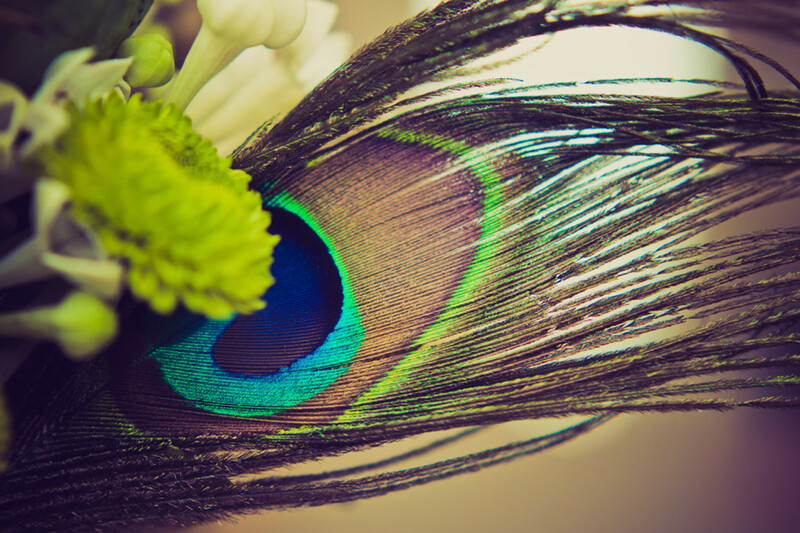 I will also focus on peacock-inspired clothing and accessories in another article. We had tons of peacock prints and feathers everywhere and I have tons of great pictures, so stay tuned for that also. Our peacock motif began with our homemade invitations. 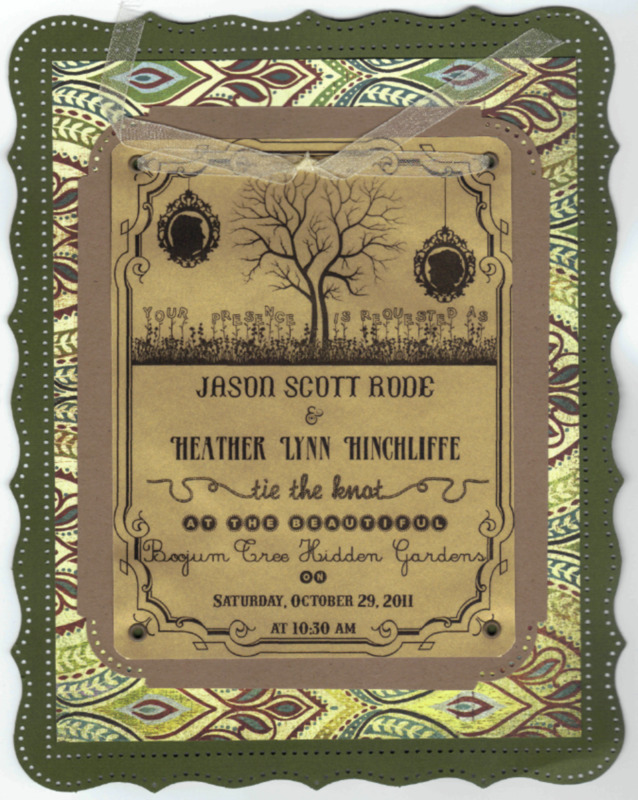 You can learn how to make these invitations in my tutorial, How to Create Unique Wedding Invitations. This was the first time that my husband and I did anything like this. We had never even touched scrapbook paper prior to this craft. Shortly thereafter, we were pros and had an assembly line going in our kitchen. We are pretty happy with how it all turned out. I had a lot of fun and would gladly do these again in a heartbeat. My husband and I designed and put together about 100 of these invitations. 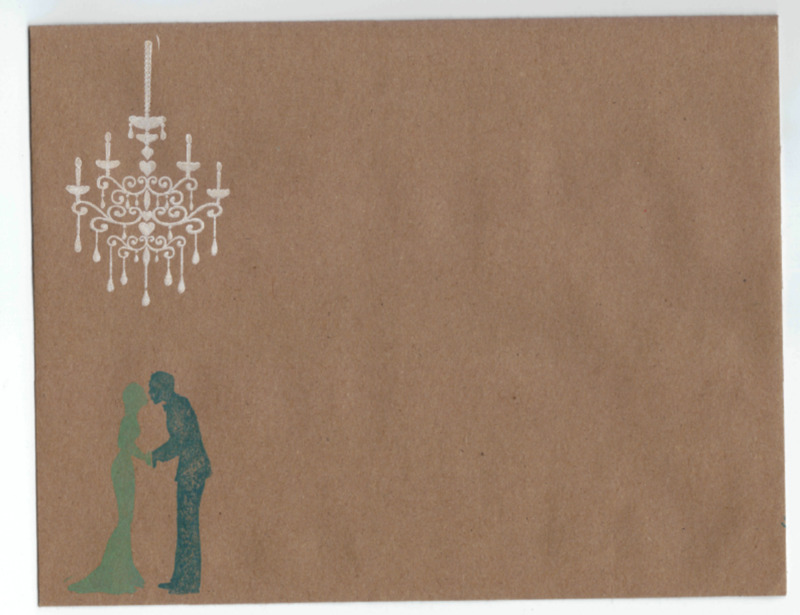 We used whatever scrapbook paper we could get our hands on that matched our wedding colors and our 1920s wedding theme. Two pieces in particular featured a peacock design that I absolutely love. Both papers had a cream background. Nothing in our wedding was white because we wanted everything to feel vintage and aged. 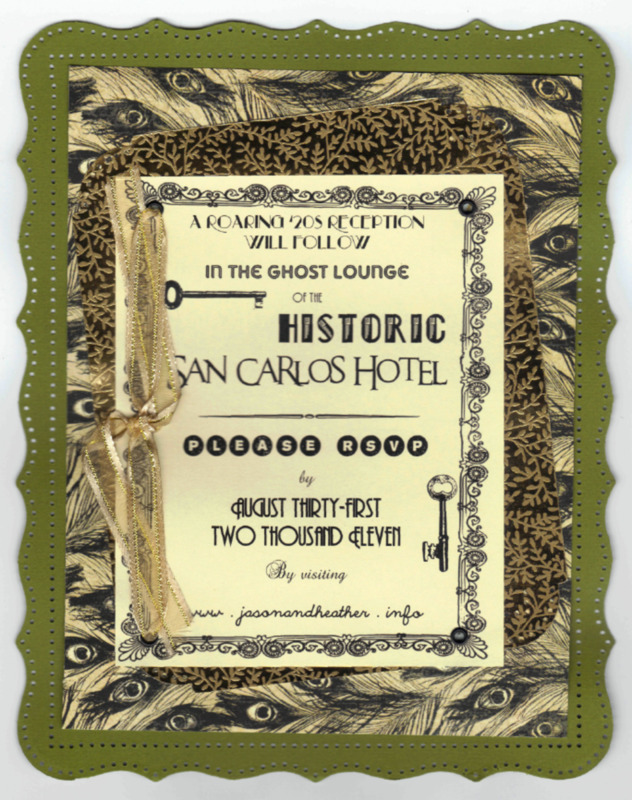 The invitations were two-sided; the first with info for our ceremony (which took place in an outdoor garden) and the other side was for the reception (which took place in the restaurant/lounge of a historic and rumored-to-be-haunted hotel). Both of these papers echoed our 1920s theme. The colorful peacock paper had a lively design and was perfect for the "garden side." The black and cream design had an almost haunting appeal and complemented the "hotel side" perfectly. 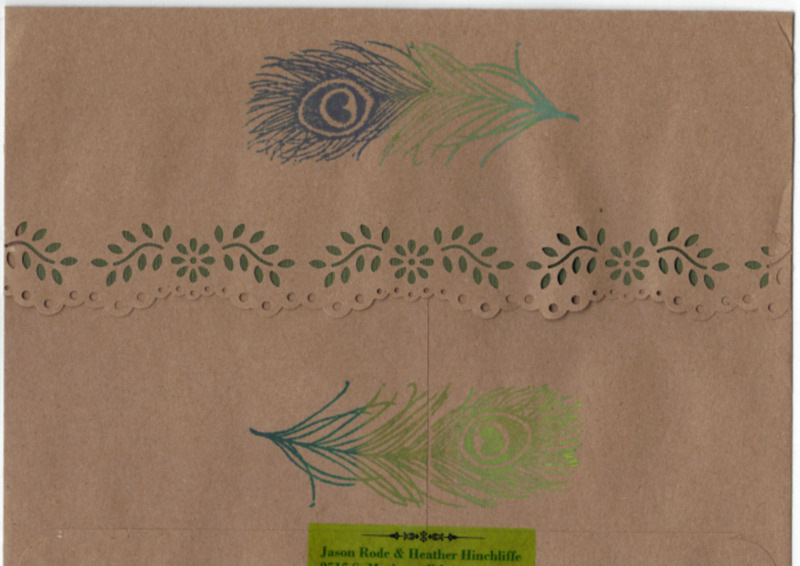 We also made our own brown recycled envelopes and decorated them using peacock feather stamps and colorful inks. On the back, you'll see two peacock feathers. I had so much fun making these. Each feather came out uniquely-colored. We saved a ton of money by doing our own invitations. This also enabled us to customize every aspect imaginable-- from the fonts to the ribbon. My husband and I learned this craft together, every step of the way. We had some frustration here and there but we love being able to say we designed it together on the computer, hand cut all the elements and put them together with love. The process itself is such a great wedding memory. 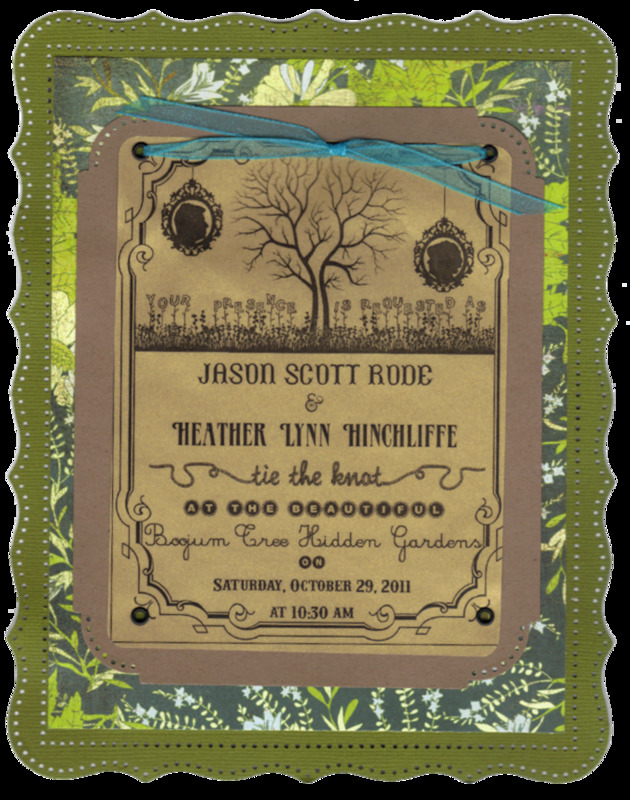 It's such a thrill and a compliment to see this wedding invitation at a friend's house displayed as a keepsake or art instead of just a piece of mail. Heather Says: Using a peacock feather stamp takes some practice. So practice. It's a fine line between pushing too light which results in blank sections or pushing too hard and the feather tendrils are bloated and sloppy-looking. Also make sure the inks you plan on using are going to show up nicely on your paper. Heather also Says: Scrapbook paper is a big deal. Buy enough paper and buy extra for your screw-ups. Don't assume that a specific scrapbook paper style is going to be at the store next time. Learning that they're seasonal and can get discontinued was an eye-opener. I'm lucky that my mother-in-law is all-knowing in this department. I don't know how we could have finished this idea without her help. Lucky for us, the peacock motif complemented our theme, colors, and other motifs very beautifully. Our wedding colors (blues and greens) were so perfect, it was almost like they were plucked right from the peacock. Our wedding venues, an outdoor garden and a historic hotel built in 1928, couldn't be more perfectly paired with the peacock idea. Peacock feathers accentuated the luxuriousness of the roaring 20s and our garden wedding could have only been more perfect if we had real peacocks running around. I considered this-- believe me. Heather Says: I love Michael's and Hobby Lobby. I could easily spend $1,000 in each of those stores in about an hour. But don't buy peacock feathers there. They're very over-priced and you don't want a huge chunk of your wedding budget spent on just feathers. I got a couple hundred from a local craft store and only paid a few cents per feather. If you don't have this option, then look online. Seriously. Even the disheveled ones can be brought back to life with sharp scissors and/or a hair iron. I was inspired to use peacock feathers in our flowers while flipping through wedding magazines in summer 2011. My bridesmaids wore very bright colors, so I wanted the flowers to be more muted/subtle. The peacock feathers were also a great way to tie together a canvas of colors throughout the wedding. 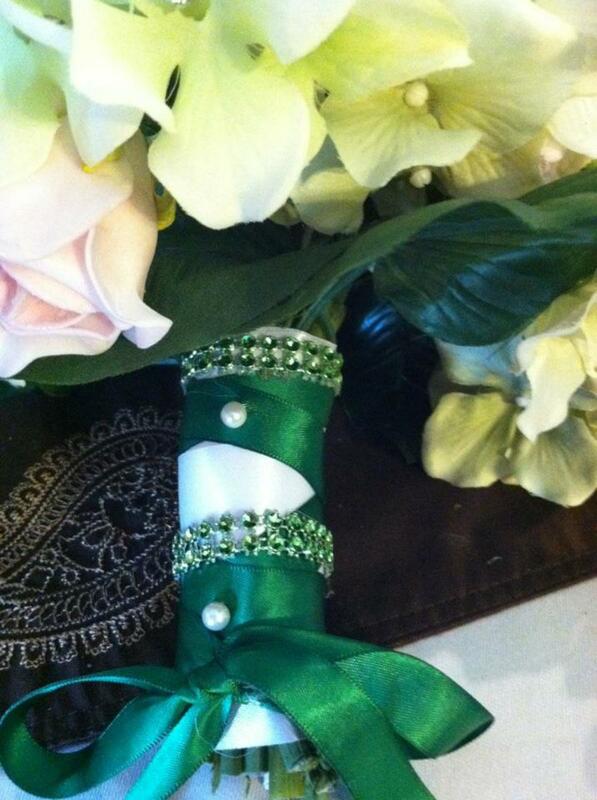 The bridesmaid dresses were lime green, gold, emerald green, teal, and deep purple. The dress colors and the peacock colors looked so great together and it wasn't even entirely planned that way. Peacock feathers were used in my bridal bouquet, my bridesmaids' bouquets, our mothers corsages, our fathers boutonnieres, and the boutonnieres of the groomsmen and ushers as well. I absolutely loved and love my flowers. They were exactly as beautiful as I imagined them. 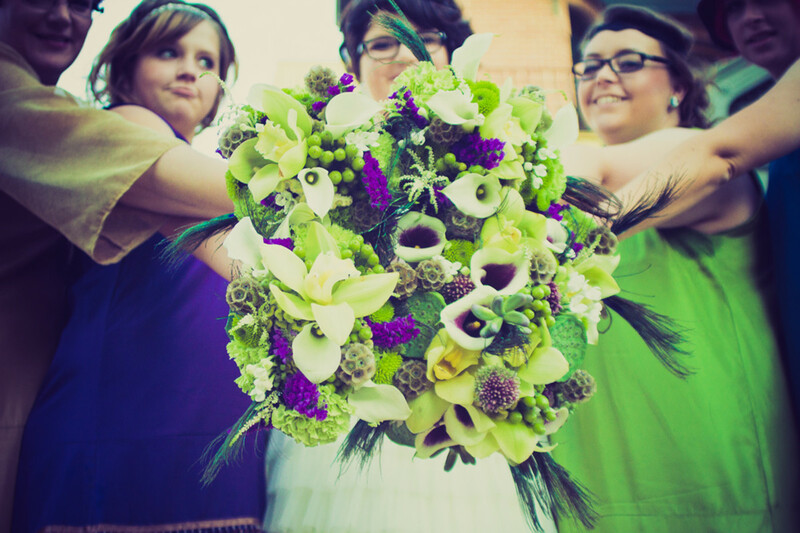 It's a very unique bouquet that isn't at all traditional. So if you opt for something like this, be prepared for silly things people will say. "Is that a wedding bouquet or a salad?" Heather Says: Stay in contact with your florist and make sure you really love your final product with the peacock accents. 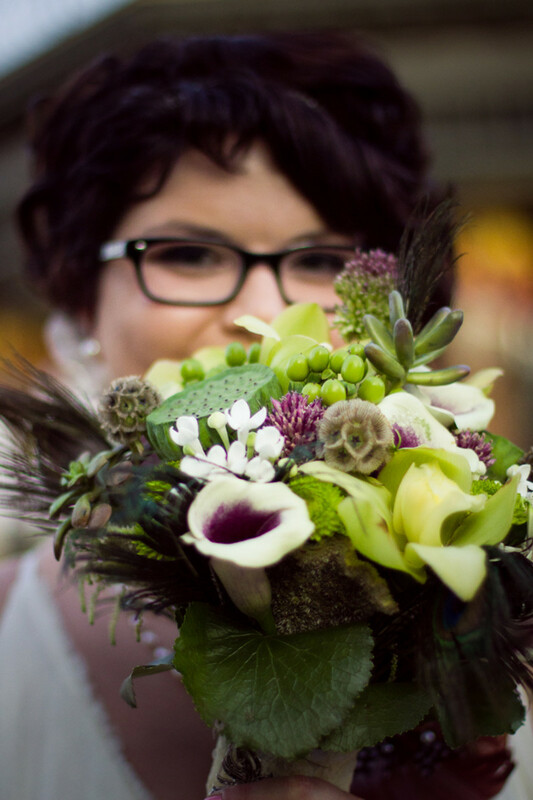 See if your florist can show you a mock-up or has photos of similar bouquets he/she has done in the past. I asked my florist specifically for photos of arrangements she did with succulents and also with peacock feathers. So be specific. 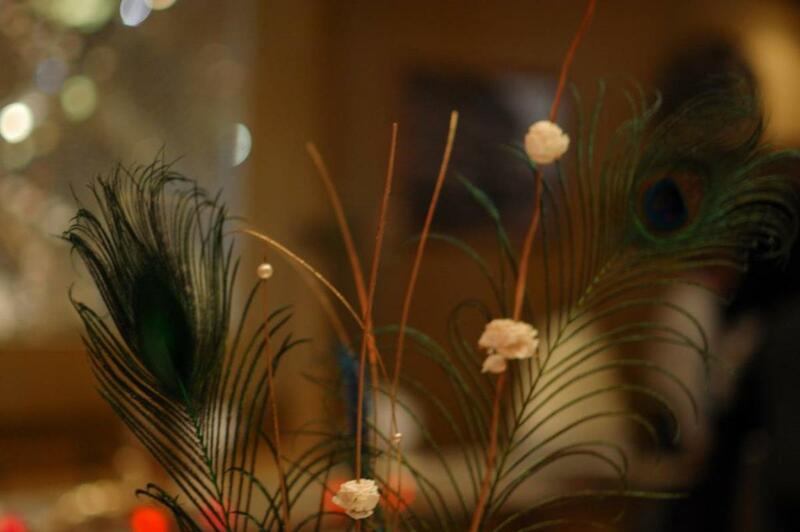 Don't assume that just because peacock feathers are popular that every florist knows how to use them. Also, make sure they will have the feathers or find out if you need to provide them. On two separate occasions, my husband and I were shopping or doing wedding errands and I saw peacocks that we just had to buy on the spot. On both occasions, I had no idea how or where we were going to use these pieces or peacocks and figured we'd cross that bridge when we came to it. We bought the gold set of peacocks at an antique store in downtown Mesa for about $15. 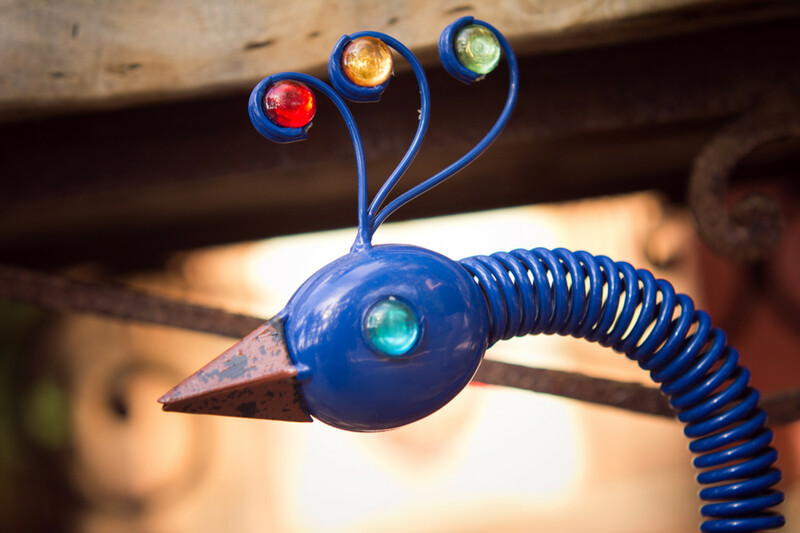 The decorative wire and glass peacock was purchased at Target in the garden center for about the same price. He was right at home in the garden setting for our ceremony. He stood next to our guest book table. The gold peacocks were left at the hotel lounge (wedding reception venue) without any instructions, because I still had no plan for them. Someone, either that worked at the hotel or someone in our family, put them at our head table and they looked absolutely perfect. I still have no idea who. If you know, please tell me! :) I'd like to thank them! The garden peacock is standing next to our garden in the front yard of our new home. The peacocks are in our living room. I sometimes wonder who else bought the same garden peacock from target last summer and if he's sun-damaged or missing stones. I'll also wonder who owned the pair of golden peacocks before us. 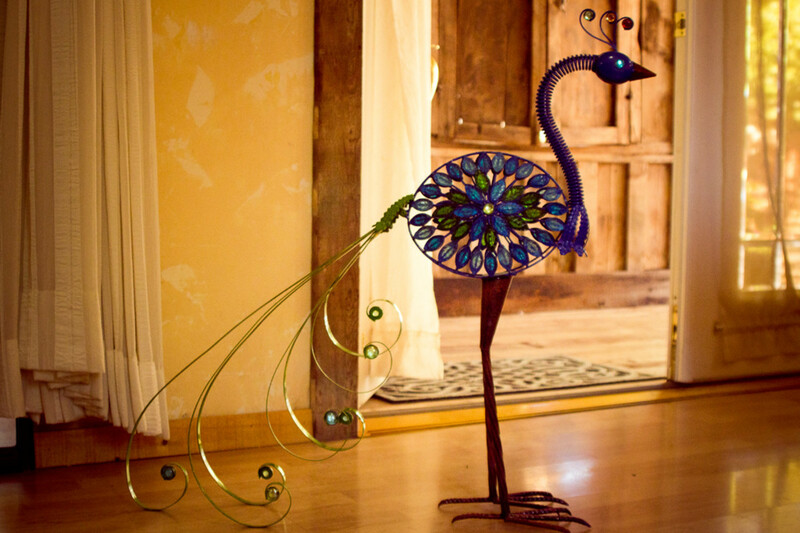 They're eccentric pieces that fit right into our wedding and now fit right into our home. We'll love them for a long time. Using tangible peacocks was great for us. Make sure they become part of the ambiance instead of feeling like awkward afterthoughts. During our interfaith ceremony, our priest and rabbi even spoke a bit about how some peacocks mate for life and gave a brief history of the peacock from the old testament. This truly tied together all of the peacock references and accents. 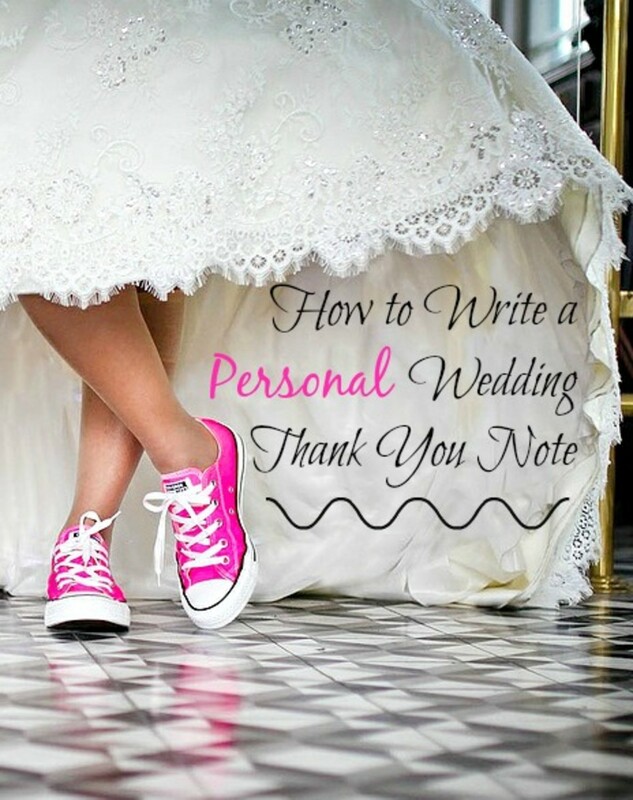 The Guestbook: Do I Have to Have a Guest Book at My Wedding? You'll always have those special memories of you and your husband planning the wedding together. That's as special as all the unique details you added to your Big Day. Fun hub! 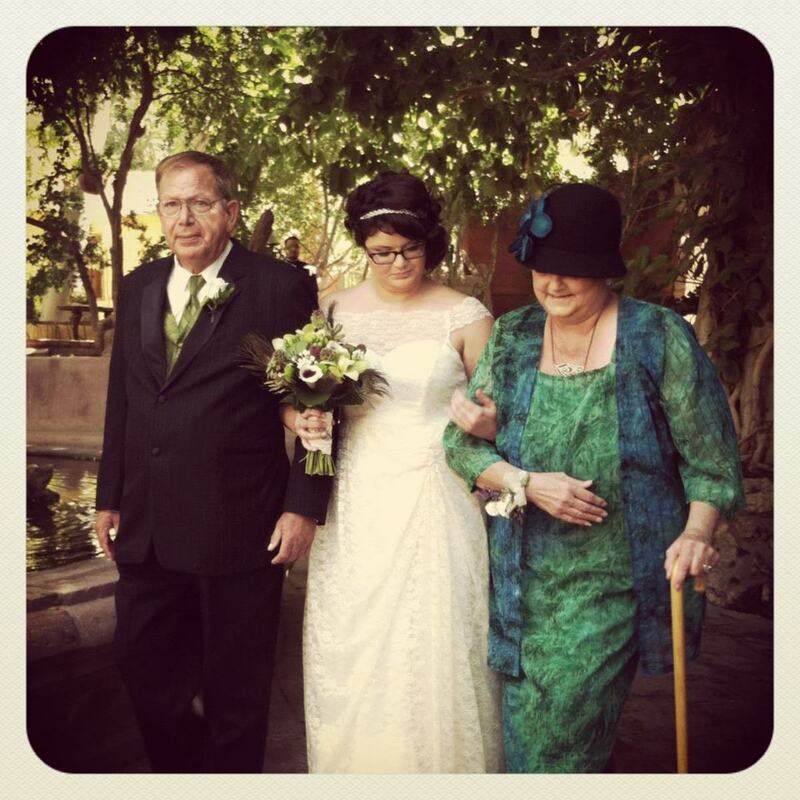 Heather, you were a beautiful bride in that dress. Your photos were exquisite too. Very smart and crafty. Congrats on HOTD! Beautiful! I love peacock feathers, and wore some in a fascinator at a wedding I attended this year. We're a suspicious lot over here though, some people consider having peacock feathers bad luck, and associate them with Hera, Zeus' jelous wife! So you can see why they're not used at weddings much in the UK. This is a great article, with some brilliant and tasteful ideas. 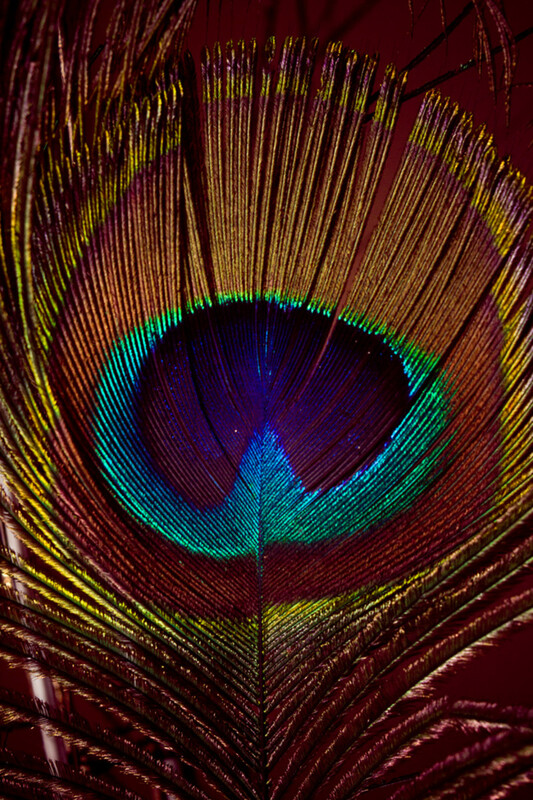 The colors in the peacock feathers are so magical. What a wonderful choice for a wedding theme. 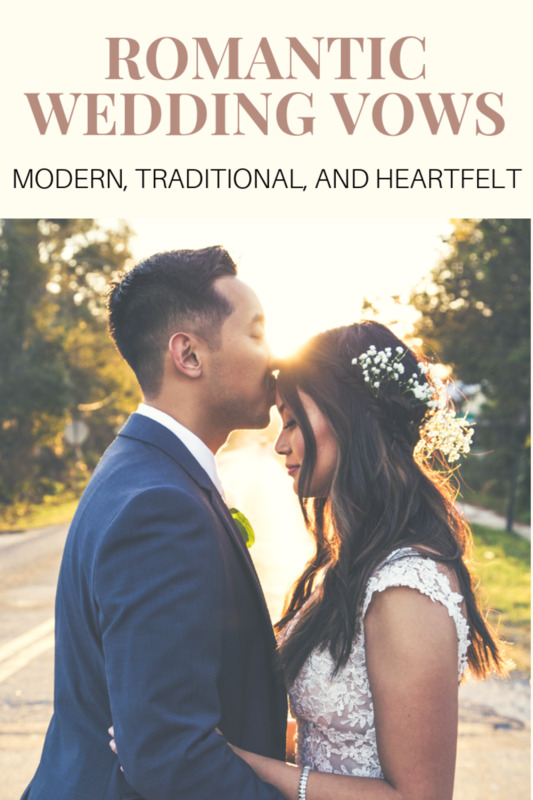 When I was married, many years ago, and in the UK, there was no such thing as a wedding 'theme' and since then I've always wondered whether themes are just a way to get brides to spend more. Sometimes, I think they are. But then your hub restores my faith. Yours was a true theme, carried all the way through, and one with meaning. 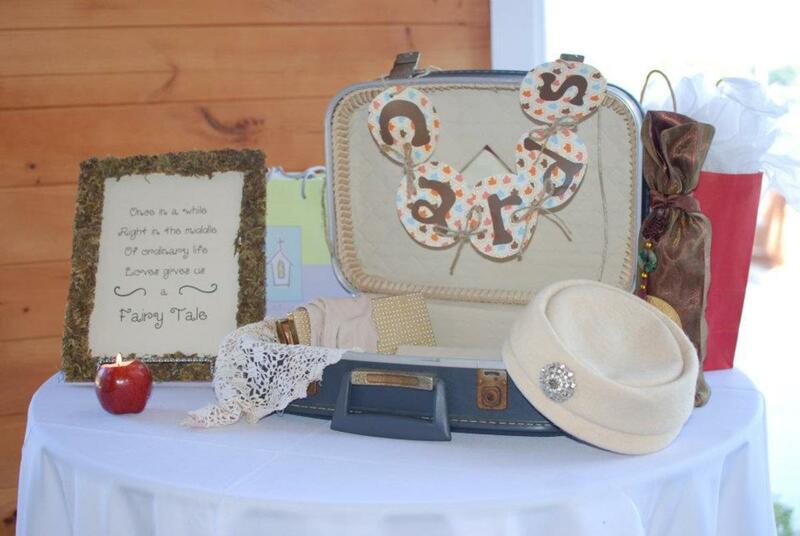 I love that the theme was included in the ceremony, as well as the decorations. Here's hoping you have a long, happy and healthy life together. Those centerpieces are awesome. You did a great job. What a great idea, and beautiful pictures. Love your wedding invites. We made our own too, and it's such a cost saver. Love all the ways you incorporated the feathers. You are very crafty. Happy day to you, and Be Well!